Now that spring has sprung, many of us will be stepping out on the town more often. Whether you’re a social butterfly or an impassioned introvert, there’s nothing like bad breath to ruin what might otherwise be a good first impression. 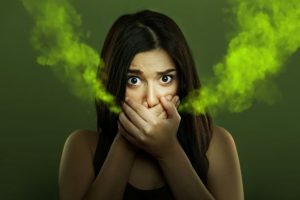 In this post we’ll offer some tips for taming that halitosis, courtesy of a dentist in Danville. Most everyone knows the importance of brushing your teeth when it comes to fresh breath. But did you know that cleaning your tongue is an essential part of oral hygiene as well? You can simply use your toothbrush or try a product called a tongue scraper. It’s hard to overstate the value of saliva in maintaining your oral health. Your body needs plenty of good, fresh, clean water in order to maintain adequate levels of this important fluid. At the same time, important to limit consumption of soft drinks and alcoholic beverages, which can actually curtail saliva production. This ancient herb offers modern benefits when it comes to controlling halitosis. Enjoy a sprig or two after meals or try it in capsule form; you’ll find it online and at health food stores. Nothing will turn your breath putrid faster than tobacco. This applies not only to cigarettes but to chewing tobacco, snuff, cigars, and even vaping devices. Talk to your dentist or other healthcare provider about new medications that can help you to kick the habit for good. You may also want to investigate support groups online or in your area. Low-carb diets are a popular way to lose weight and control blood sugar. But cutting too many carbohydrates from your diet can give you bad breath. Most nutritionists recommend enjoying a balanced mix of nutrients in your daily diet, including plenty of healthy complex carbohydrates. Flossing helps to control bad breath by removing plaque and food particles. If you dislike flossing, then try an interdental toothbrush or water stream flossing device instead, both of which offer similar benefits. Sugar-free gum helps your breath in two ways. One, it masks objectionable odors. Two, the chewing action stimulates saliva production, curtailing bad bacteria. Self-care is essential for controlling bad breath. But by itself it’s only part of the story. Plaque and tartar will continue to build up on your teeth, not only causing halitosis but leading to more serious problems like tooth decay and gum disease. Your dentist can help by performing a professional tooth cleaning and by examining your mouth for potential problems. A good rule of thumb is to see your dentist every six months for a routine checkup. Your breath need not be a source of embarrassment. Use the tips in this post to tame the problem while enjoying healthier teeth and gums at the same time. There is no better way to greet the return of warm weather. Dr. Justin W. Armbruster studied dentistry at the Kentucky College of Dentistry and the University of North Carolina at Chapel Hill. Besides being an outstanding general dentist, he’s specially trained in restorative and rehabilitative techniques. You can reach his office online or by calling (434) 822-1332.